When walking though the grocery store, I spotted a box labeled ‘Blueberry Muffin Oatmeal’. I didn’t stop to see what it was exactly, but in the back of my mind I was thinking “boy that sounds tasty”. 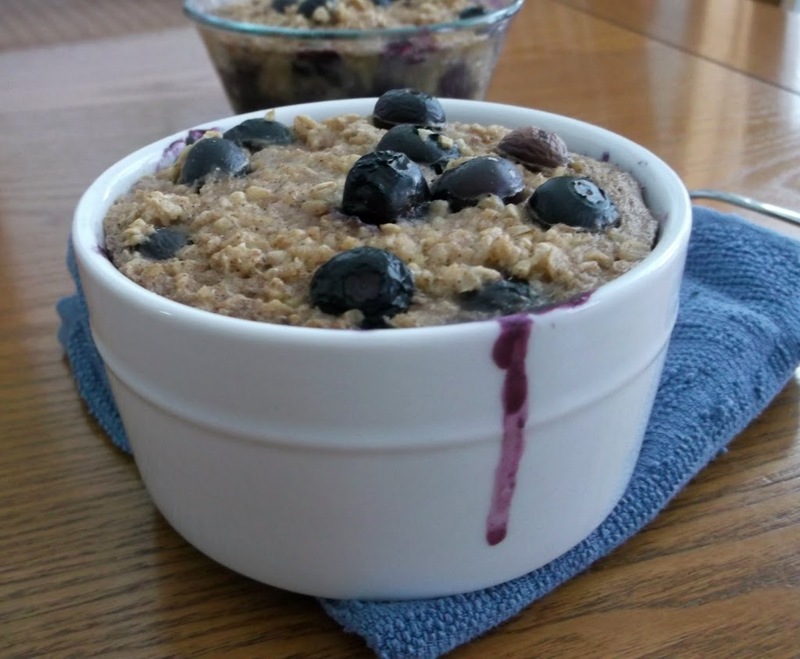 As the day went on I could not get those words out of my head; I went online to see if I could find a recipe for this type of oatmeal. I found one on Pinterest of course and it sounded yummy, so I put it on my list to do for the weekend. The oatmeal is baked in the oven, which I have never tried. When it comes to oatmeal I am the type that usually makes it the microwave, nice, simple, and fast. And when making oatmeal in the microwave if I want to be fancy I usually throw in a few raisins. So when I found this recipe I was excited to try it, something a little special for Sunday morning breakfast. I doubled the batch so that my daughter Krista could have a bowl also. She is our healthy eater in the family and she enjoys oatmeal. And that is another thing about the recipe that I really liked it is really healthy, no sugar added. Preheat oven to 350 degrees F and lightly spray a single serve-ramekin. In a small mixing bowl, stir together 1/2 cup rolled oats, 1/4 teaspoon cinnamon, 1/4 teaspoon baking powder, and a pinch of salt. In another bowl, mash half a banana, then add a 1/2 cup milk and 1/4 teaspoon vanilla extract and stir. Add dry ingredients to wet ingredients and combine. 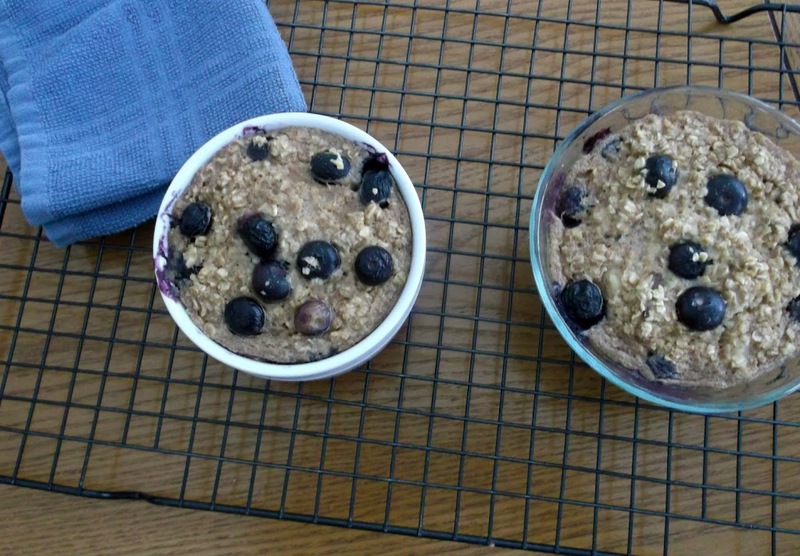 Finally add approximately 1/4 cup fresh or frozen blueberries and fold them in gently. Pour the mixture into a ramekin and bake for 25 to 30 minutes. (Note: I doubled this for 2 servings). Hi Dawn, this looks so good – and with no suger added … I like oust meal & look forward of trying this recipe – yum! This looks way better than my boring fiber cereal. YUM. What a great way to start the morning…looks very tasty and hearty. 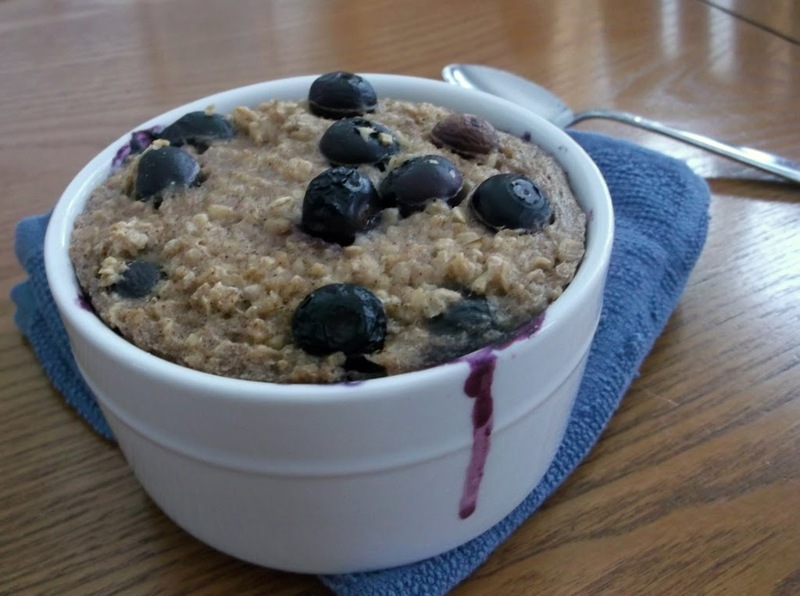 Mmmm…I’m not an oatmeal eater, but this looks darn tempting, Dawn! Gosh, I happen to have some fresh blueberries on hand. And there’s oatmeal in the pantry. I’ll bet you can’t guess what I’m thinking about making! 😉 Really nice recipe – thanks so much.